High sound quality is critical to the success of most fMRI procedures. A Sleek Lightweight Remote Control with an audio controller accepts any digital device to output sounds to the patient in the MRI. (1) The State-of-the-Art Audio Controller accepts input from a full range of audio entertainment systems. 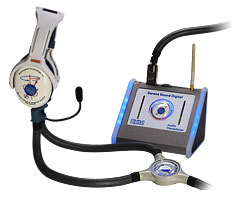 SereneSound's State-of-the-Art Headset and Transducer seamlessly receives concert-quality sounds from the control room. And the SereneSound for fMRI offers the most reliable, highest quality MRI-compatible all-digital sound quality available today. With frequency response from 40 Hz. to 40 kHz, it can reproduce an industry-leading variety of sound stimuli, whatever the audio source. Designed to fit in a standard head coil, the 30 dB noise attenuation headset, reduces distracting gradient noise. This ensures the subject will hear only your intended stimuli. Two-way communication and dual volume controls allow easy patient communication during the sequence and accurate recording of verbal response. The built-in active noise-canceling microphone enables clear patient response with a minimum of background. Our unique Ultra-Fidelity Headsets provide an even greater frequency response. The unit also can be upgraded to video with the addition of the VisuaStim Digital visual display.